My old bed from IKEA lasted 18 years... yes ...I still dont believe its been 18 years, and that includes the IKEA mattress too.. I have always had issues with my back muscles, and as I have progressively aged, my back in tandem seems to be acting up more, the old bed didnt help, I would wake up in pain and have to use my hot pack several times a day just to be able to move without wincing or moaning. So after weeks of scanning websites, sales and going down to try out mattresses I finally bought a new bed. My old bed was low, about 1.5 feet off the ground, which made it harder for me to get off the bed after a night of painful back breaking sleep on the woefully inadequate support mattress I had, but the bed frame was still in pretty good shape. Which led to weeks of agonising debate within myself, on wasting a perfectly good bed frame.. but it had to go. 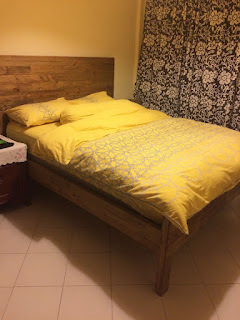 So I did the next best thing, I put it up for sale on Carousell, where we in Singapore sell everything (I have sold my old corelle tea cups and my old winter coat) The bed frame sold within hours of me putting it up on the site which made me happy to know that the bed frame was going to be used and not just wasted. The mattress however would not be good for anyone, so I would have to throw that away... to the landfill it goes I guess..
My old bedside tables are dwarfed by the bed, but I wont be getting rid of those as they are mid century pieces that my grandmother used.. but I finally feel like a big girl now with a nice adult bed..